This morning, I woke up to another gorgeous, blue-skied day. The birds were chirping, the air was still, and it looked like a beautiful, calm day. As I was doing my chores outside, I heard my neighbour call my name. "Miriam, have you heard? The highway is closed!" I went over to the fence for a little chat. "I know, it's been closed for a few days already." "No, not westbound. Eastbound! We are cut off from town!" That got my attention. "What?!?" "Yes, the bridge is flooded and they closed it. They're also saying that they'll have to turn the power off soon to work on the power lines." Sure enough, when I returned to the house, the power was gone. Our first concern was our incubator, where 200 chicks were in the process of hatching. The days right around the hatching date are critical, with the babies being at their most vulnerable. A few hours without the warmth and moisture of the incubator will kill them. Thankfully, our kind neighbours offered to lend us their generator, an offer we promptly took them up on. They are the best. 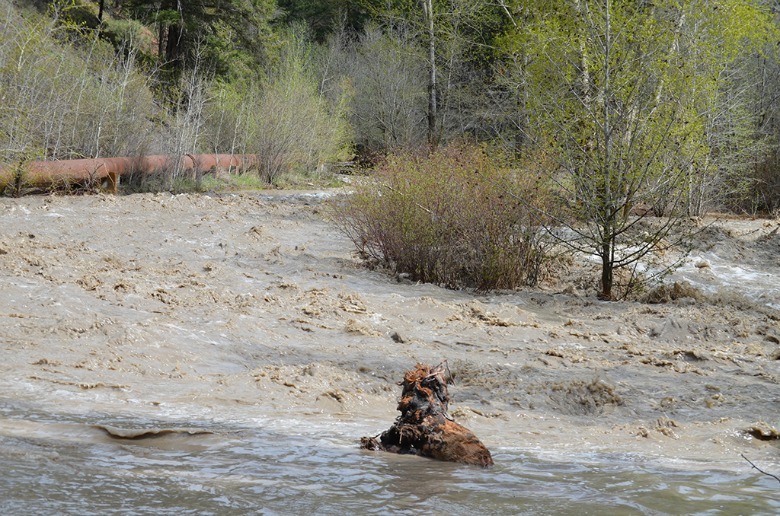 As you may have heard, over the weekend there has been substantial flooding in parts of southern British Columbia due to the snow melting and recent heavy rainfall. The bridge my neighbour was talking about is on Highway 8 - the only way into town. With that bridge closed, we were cut off from food, gas, and medical help. An unsettling feeling. "I want to see this for myself. I'm gonna take a look. You want to come?" I asked my neighbour, who said "heck, yes!" and jumped into the passenger seat of my car. Driving along the river, we saw that it had at least doubled in size and risen several feet. Instead of its usual tranquil gurgling, the river roared along its swollen bed, brown and angry looking. And then we approached the bridge. A tow truck was parked along the road to block it, and several police cruisers were on side. They were not the only ones: At least a hundred people were there to see the flooding with their own eyes! Without power and no cell reception for many of us, the only way to gather information was the old-fashioned way: By going there and talking to people. Maybe because of the gorgeous spring day and no imminent danger for most people there, the atmosphere was strangely festive - it almost felt like a day at the fair! People were standing together in groups, chatting amiably, and craning their necks to get a better look. That was this morning. Our power came back about an hour ago, and while we are still cut off from town, as far as I know the bridge is in sound condition, but still closed due to water and debris. Nobody from our area went to work today, and I don't know what would happen if someone has a medical emergency - I hope that an ambulance is still able to come through. Let's hope it doesn't come to the test! Goodness, I would hate the feeling of being cut off from medical help. I'm sure you have helicopters for emergencies, right? But do you have a way to contact them? I guess if we'd call 911 they would send one? As far as I know, no medical emergency occurred, thankfully! One lane has been opened, so we are no longer cut off! Oh WOW Miriam! I hope you are not cut off much longer. Are the hatchlings ok? Yes, they all survived! And the road opened this morning, one lane only, but we are no longer cut off from the world. All things considered, we got away easy!